Hitachi Global Storage Technologies—aka HGST, aka a subsidiary of Western Digital—was recently showing off its gigantic new 10TB hard drive at the Linux Foundation Vault tradeshow in Boston. But unfortunately you won't be packing 10,000 gigabytes into your laptop anytime soon because the drive is designed for use in servers, and mostly because it requires special software to work. 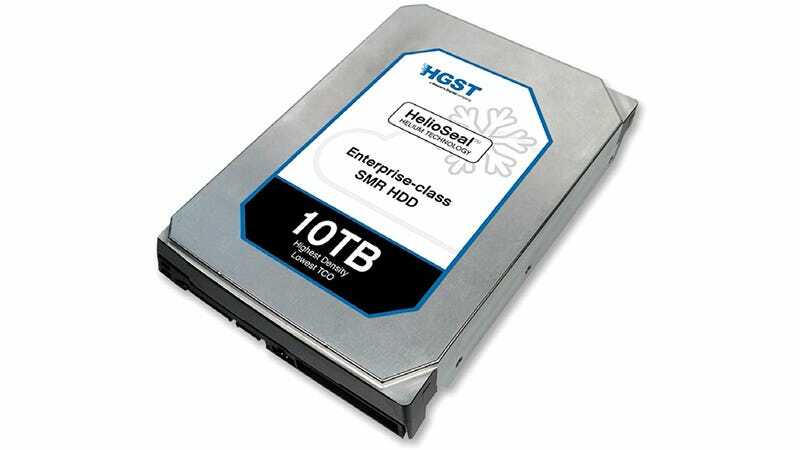 Originally revealed back in September of last year, HGST will finally be shipping its 10TB SMR HelioSeal HDD sometime in the second quarter of this year. But the drive will require special updates to an OS like Linux in order for a server to actually be able to read and write to it thanks to the radical new storage technologies it employs. The HelioSeal technology simply means the drive is actually pumped full of helium to help reduce friction between the read/write heads and the platter which allows HGST to squeeze more platters inside since there's less heat to have to deal with. It's the SMR technology that poses the software problems. SMR stands for Shingled Magnetic Recording and it basically describes how data is written to the platters. In a traditional hard drive the data is written in thin lines with a tiny gap in-between each one to help minimize corruption. It's similar to how grooves of music are laid out on a vinyl record. With SMR those data tracks slightly overlap instead, like waterproof shingles on the roof of a home. There are no longer any gaps in-between each track which allows more data to be stored on a single platter, but at the cost of more complicated software on the OS to properly read, write, and over-write data without destroying neighboring tracks.